2012 Ford Focus: Now With Added Wert! 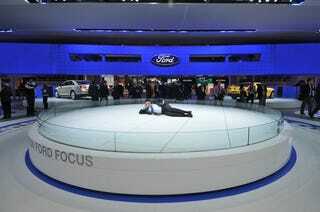 Ford's 2010 Detroit Auto Show display: 81 cars and one saucy Hebrew minx. We can actually hear Henry Ford rolling over in his grave. Ford To Detroit Auto Show: "Yeah, We&apos;ve Got Somethin&apos;"